Senior dogs can sometimes have incontinence issues. If you don’t want to use drugs or if the drugs don’t work for your dog, here are the step-by-step instructions for diapering your canine. If you have another system or an improvement on ours, by all means please go to our Contact Us page and let us know. We use Simple Solution or Petco brand. They have velcro closures. These are not the kind with the absorbent material built-in as we’ve found those to be too slippery to keep on the dogs. We use Luv’s, but anything should work except for the really cheap no-name brands which don’t absorb worth a hoot. Size 3 will work size-wise, but will not absorb near as much liquid. These instructions are for Weim-sized dogs, if you have a smaller dog the smaller baby diapers will fit better. You’ll have to experiment. 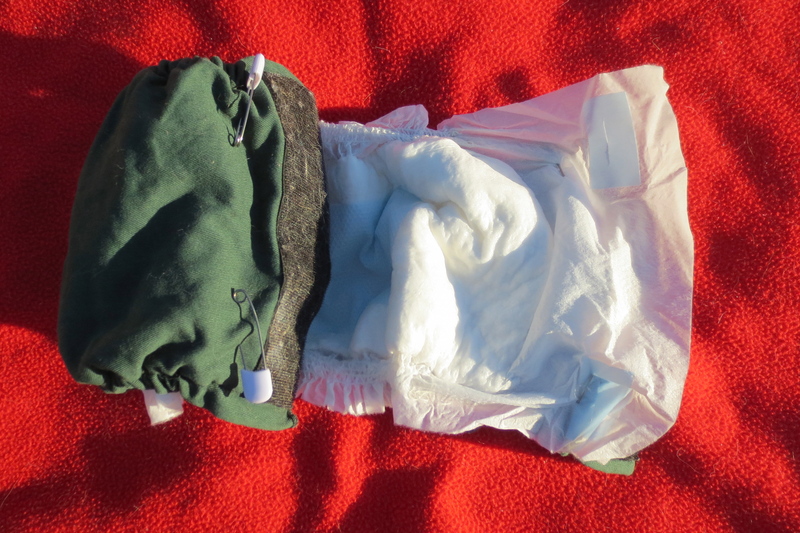 Lay the cloth diaper out flat and place the baby diaper on top. The tabs on the baby diaper without the velcro go at the end where the tail hole is. 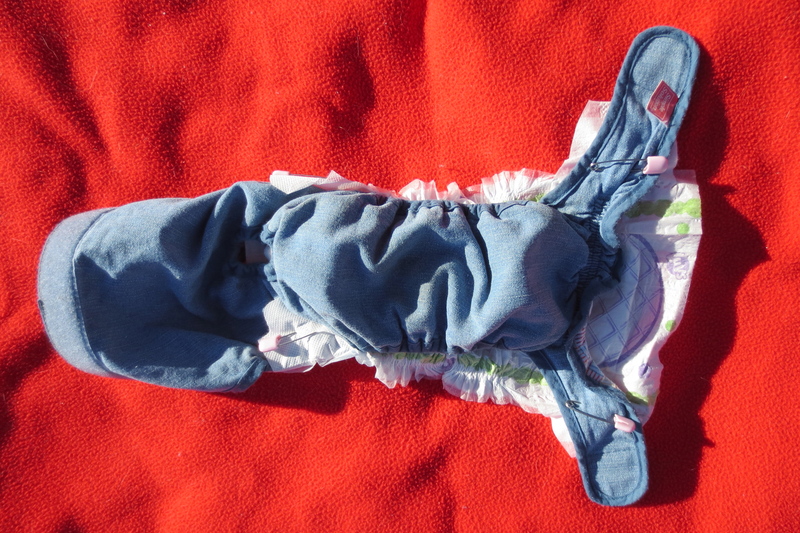 Place the top edge of the baby diaper just a bit over the tail hole. This will assure a snug fit around the tail and less chance of leakage. 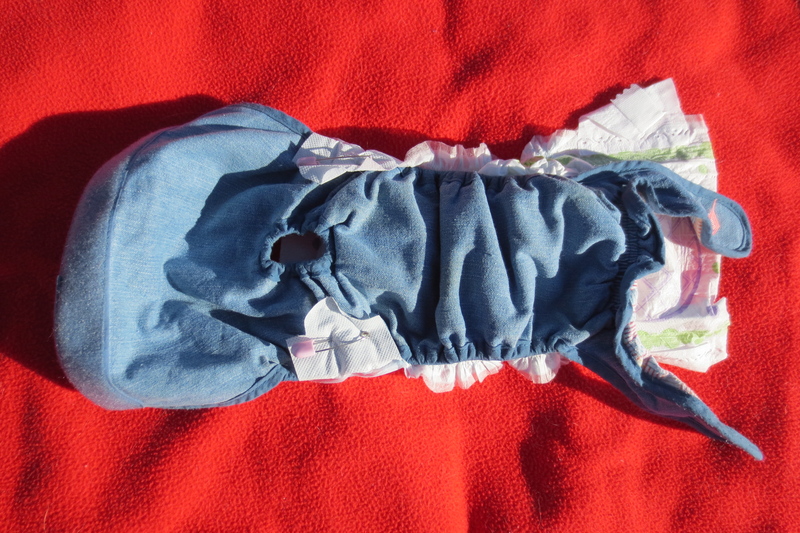 Fold the tab over and use one of the pins to secure the baby diaper on the OUTSIDE of the cloth dog diaper. Fold other tab over and pin the same way. 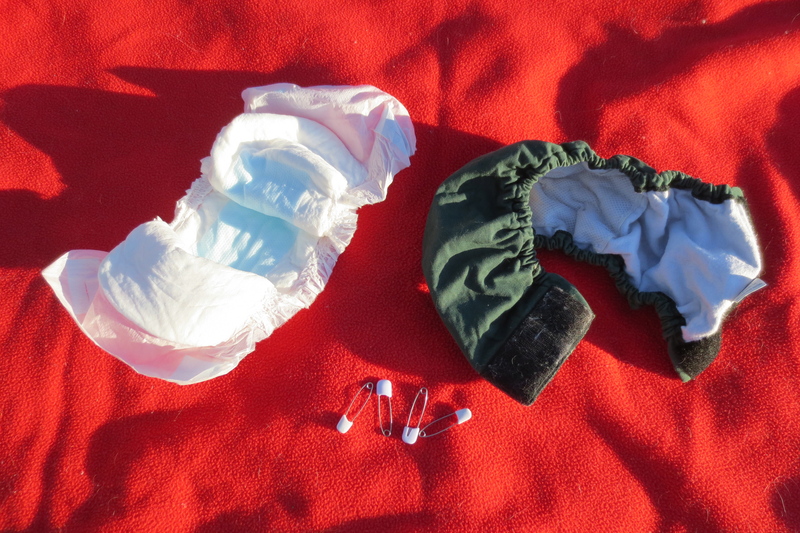 Take the velcro tabs of the baby diaper and pin them to the tabs at the other end of the dog diaper. Put the pins on the OUTSIDE of the dog diaper. 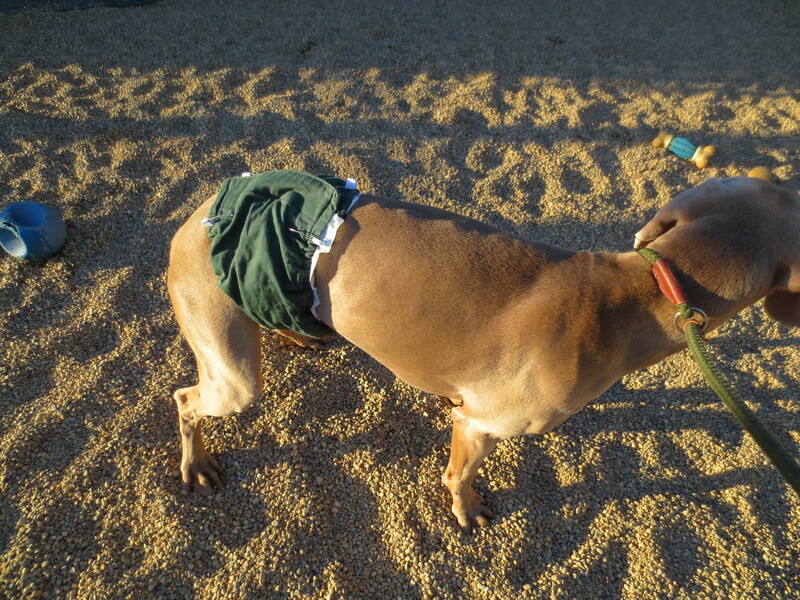 Put the dog’s tail through the hole and secure the velcro tabs of the dog diaper on top of their back. It needs to be snug. 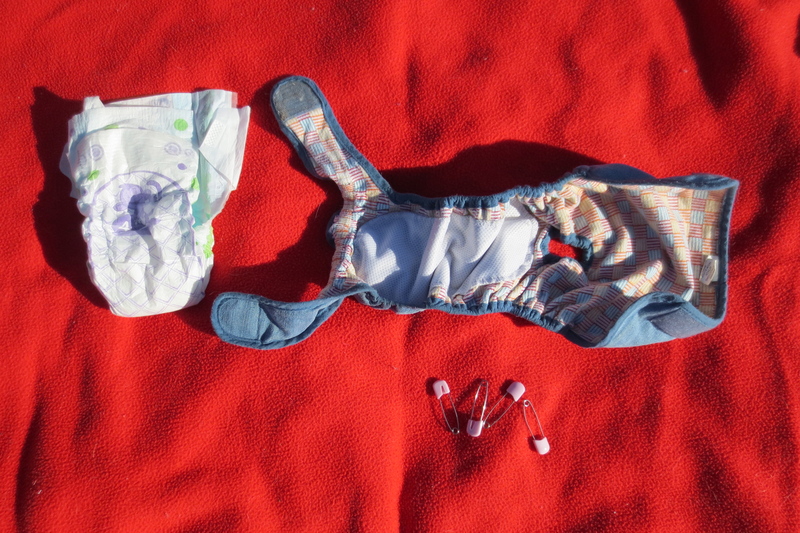 If you have problems with the velcro holding, get two more diaper pins and pin the tabs in addition to doing the velcro. It’s more of a pain to get the diaper off, but it keeps the darn thing on! We use Simple Solution, Drs. Foster & Smith or Petco brand. They have velcro closures. These are not the kind with the absorbent material built-in as we’ve found those to be too slippery to keep on the dogs. These are found in the adult diaper section of most stores. They are wide, long, absorbent pads. They do not have sides like underpants, nor do they have any adhesive. They are held on humans with elastic bands that button into them, but you will not be using the bands. 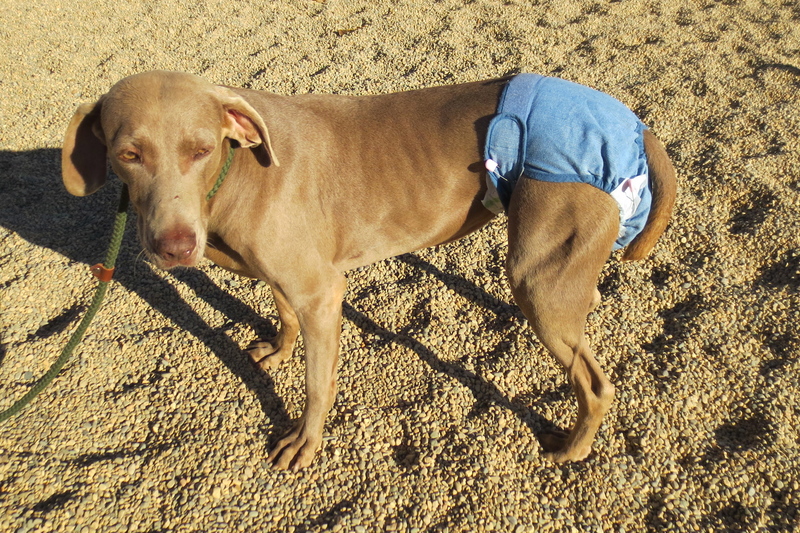 Again, this is for a Weim-size dog, if you have a smaller dog, experiment with different size incontinence pads (they absorb faster and more than feminine pads). Lay the dog belly band out flat with the side that goes toward the dog facing up. Lay the belted shield inside of the belly band with the absorbent side up (of course!). Pin the shield to the belly band at each end on the OUTSIDE of the belly band. Wrap the belly band around your boy and secure the velcro at the top. You may add more baby diaper pins as needed.